Flying into Toronto Airport with the CN Tower. We visited Canada in the summer of 2018, travelling west from Toronto to Vancouver. We stayed with friends in Toronto, having flown from Minnesota and the view from the air approaching the airport was spectacular. We caught the metro to downtown Toronto and since Aleks loves aquariums, Ripley’s Aquarium was a must. After all the sharks and fish in the aquarium we ran out of steam, so we’ll have to scale Toronto’s CN Tower another time. Looking up, I was amazed to see a group of people hanging from the top of the tower, doing an ‘Edge Walk’. If you have a head for heights, then maybe this is for you…. Dragan and Darko, were due at a conference in Kingston the following day, so we drove with Aleks and Darko’s daughter, Anya to spend a few days in this pretty lakeside town. You know I think I had the best cup of tea ever in a hipster cafe in Kingston called ‘Sipps,’ when the two dads were at their conference. The kids had a lovely hot chocolate and muffins. So Kingston is a very interesting place, great for sailing, home to the 19th century Military Museum, Fort Henry and it is located in the Thousand Islands area of Lake Ontario. Aleks and Anya became 19th century British Army recruits for the day at Fort Henry and they mustered with gusto, before collecting their meagre wages. (Canada was a British colony in the 19th century). A trip to Fort Henry with children is really good fun and very educational. There are lots of opportunities to dress up and take part in 19th century military life. I recommend keeping track of the events during the day, so that you don’t miss the canon firing and many other activities. As it is a Fort by water, it is very exposed with very little shade - I suggest wearing a hat and suncream! We took a lake cruise around the Thousand Islands. It was very beautiful and I found the commentary very interesting, but the kids seemed to have an endless need for food and drinks from the galley!! Stunning what kids are able to consume in one hour when they’re a bit bored! Sailing dinghies with the crew on trapezes! ‘To count as one of the Thousand Islands, emergent land within the river channel must have at least one square foot (0.093 m2) of land above water level year-round, and support at least two living trees.’ - Wikipedia. Luckily our hotel had a pool, because it poured with rain for more or less two days straight after that. The kids were therefore kept busy! We headed back to Toronto, dropped our friends home and had a quick pit stop before driving to London, Ontario. We stayed with friends in London and they arranged various outings for us all, including a trip to Niagara Falls. 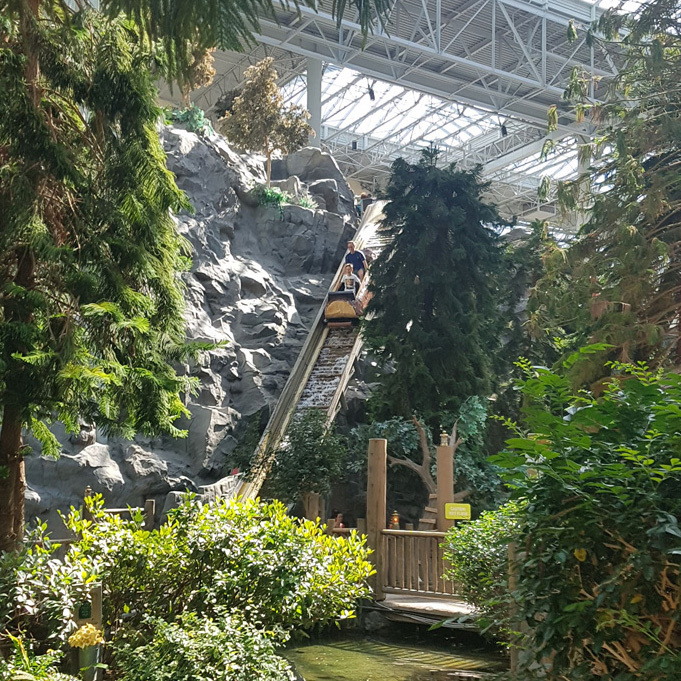 The falls are big and it’s also big business, but with a staggering number of visitors, it needs the infrastructure and amenities there for everything to run smoothly. Despite the crowds, we didn’t have to wait long and the boat trip below the waterfall was wonderful. Lots of spray and oohs and aahs, with everybody made equal in pink plastic ponchos! Aleks with the USA side of the Niagara River in the background. Niagara Falls Zip Wire. Not everyone’s cup of tea! After the waterfall, we drove to the cute village of Niagara-on-the-Lake. If you’ve ever been to Britain, you may experience a deja-vu if you visit here, as this lovely place has British-style red brick shops, hotels and tearooms. Victorian Britain with a Canadian twist. Marmite, Walker’s shortbread and British tea can all be found in the local grocery store. It’s very touristy, but also delightful. The give away for me were the extremely exotic hanging baskets and plants! In London, Ontario, we visited Eldon House, a beautiful Georgian and Regency building, which belonged to the Harris family for four generations. It is very unusual, in that the decor and furniture are mostly completely original. The house was given to the City of London in 1960. We hoped to have high tea here, but it was fully booked, obviously very popular! I loved reading about Amelia Harris (1869 - 1959) who went to school in Torquay, England. So at this point, we were about halfway through our trip. Having said goodbye to our friends in London, we drove to Hamilton Airport to fly to our next stop, Calgary and the Rockies. I loved Hamilton Airport, it even had a small art gallery with local art on display. I think it reminded me of airports from the 1970s - small and charming. My next Canadian blog post is about our stay in Calgary, the Rockies, Vancouver and Vancouver Island! Before moving to the Netherlands in August 2018, I ran several fabric printing workshops at Sidmouth Fabrics & Haberdashery in the UK. Julie Steeples, the owner of Sidmouth Fabrics, runs textile courses, teaches dressmaking and also runs a successful fabric shop. The Fabric Printing Workshop starts gently with a coffee, whilst we explain the schedule for the day. The course participants are able to purchase some fabric of their choice from the shop and the lino, the cutting tools and the special fabric inks are ready to use. A repeat pattern with a tile shaped stamp by this course participant. Two blues were used in a painterly way. The participants begin by creating a design that would be suitable to carve from their lino stamp. The design is then transferred with tracing paper onto the lino and the cutting out is begun. Once the lino stamp is ready, the ink is rolled onto the lino stamp with a small roller and then the stamp is pressed onto the fabric. The ink only sits on the lino stamp where it has not been carved. All carved areas remain the colour of the fabric once printed! The stamp was cut into a flower shape and printed randomly. Some course participants choose to make a random pattern, but others choose to use repetition in a more structured way. All colour and design choices are their own. The ink takes about a week to cure. No ironing is needed with Speedball Fabric Inks and the fabric will be colour fast but using high temperatures when washing the fabric is not recommended. The course participants are then able to take their stamps and printed fabric with them. The fabric can be then made into lampshades, cushion covers, bags etc! 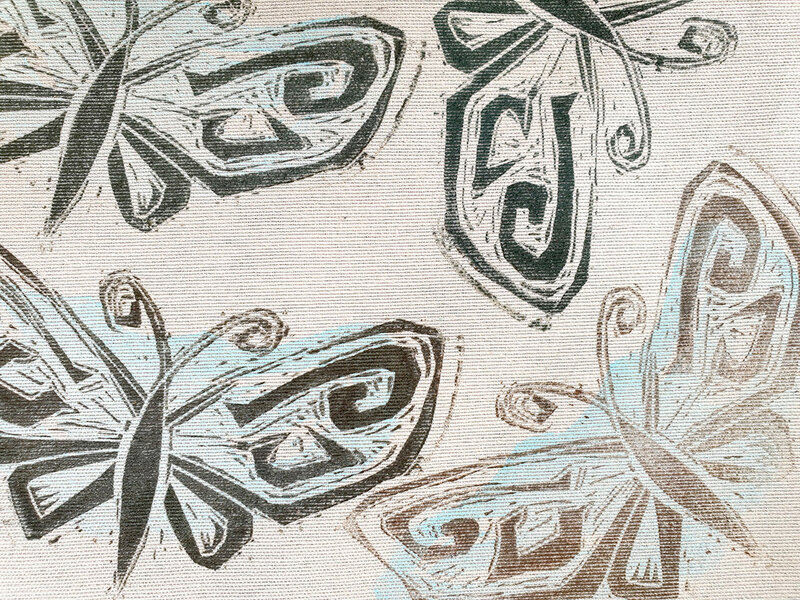 I have added a few examples of my own fabric printing items. Below is a hand-printed table runner I made, depicting typical Dutch houses with a nod to Delft’s beautiful blue and white ceramic ware. And a group of test pieces that I made recently. This is a cushion I made from hand-printed fabric, which you can see being printed in the short video below. So if you are interested in printing your own fabric, I hope this gives you some ideas or if you’d like to join us at Sidmouth Fabrics on June 1st 2019 please click on the link below for workshop details and how to book. In the winter of 1996 I visited my aunt and uncle in St Paul, the less well-known of the Twin Cities, in Minnesota. Minneapolis being the more outgoing twin. Blue skies, frozen lakes, snow and a bitter dry cold are how I remember it. This summer I visited again with my family and was surprised to discover how lush, green and watery (not icy) Minnesota is! As a newbie in the States in ‘96 the most enduring impression for me was the apparent lack of people in downtown St Paul, until I discovered the balmy malls and sky-ways that opened up inside the skyscrapers. 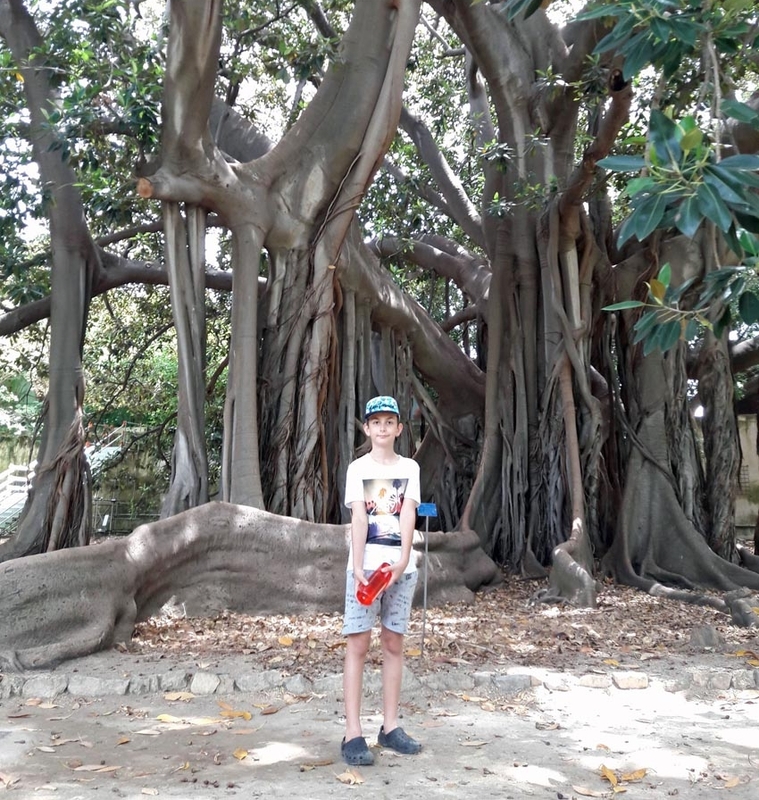 With my family in July this year, it was the heat that kept us off the street, but we enjoyed milling around in the air-con cafes, shops and spotless atria. Downtown St Paul, with pastel shades and a minimal style, but where are all the people? Soon after we arrived in the US, we visited the Asian Market in downtown St Paul, displaying colourful flowers and vegetables. We pottered around the market and my aunt bought some beans for a delicious curry she made later that day. Our hosts enjoyed taking us to the local sights, including Minnehaha Falls . Jacob Fjelde’s sculpture, ‘Hiawatha and Minnehaha’ has stood near the falls on the banks of Minnehaha Creek, since 1912. Based on Longfellow’s poem, ‘The Song of Hiawatha’, the sculpture has been featured on postcards for over 100 years. After cooling off in the spray of the falls, we stopped for a soup and sandwich lunch in one of the many cafes and delicatessens in the region. The interiors of the dellies typically have high ceilings, dark wooden features and luxurious leather booths. The sausages at the Ukrainian Deli got a definite thumbs-up from my Serbian husband, Dragan. Minnesota’s famous ‘Spoonbridge and Cherry’ sculpture by artist Coosje Van Bruggen (originally from the Netherlands) and her husband Claes Oldenburg can be found at the Minneapolis Sculpture Garden. 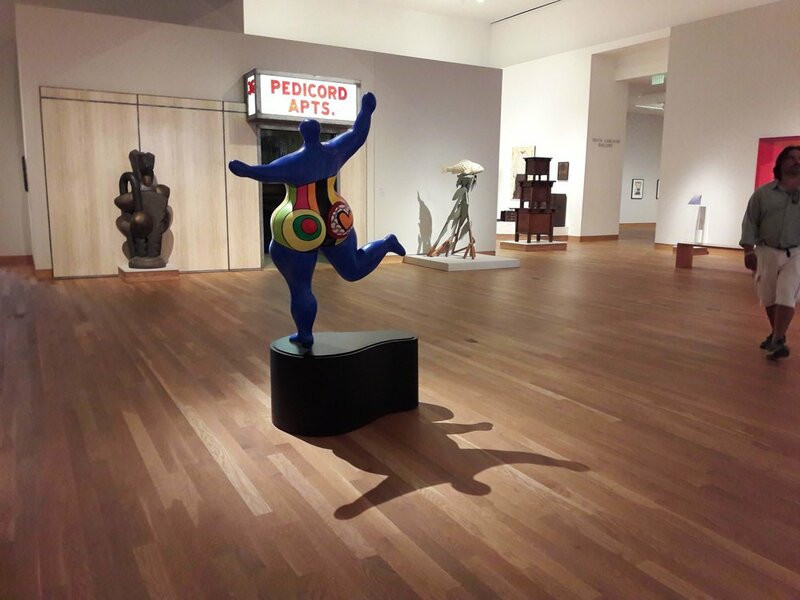 It is full of fascinating sculpture from the 20th and 21st centuries and is definitely worth a visit. It takes some doing to come up with something truly original, but in 1931 Calder did just that with his kinetic sculptures. They became known as ‘mobiles’ and this beautiful example employs Calder’s typically colourful abstract forms. I have always liked his work. Untitled sculpture by Jim Hodges. Did a giant dip these boulders in molten metal? Unofficially and affectionately known as the ‘Chicken Painting’, it is officially an ‘Untitled’ painting by Minnesotan artist, Doug Argue at the Weisman. We took a short road trip to the neighbouring state of Wisconsin and enjoyed a stroll by the Mississippi on a pretty little shore called Sea Wing Park in the town of Diamond Bluff. The river marks the boundary between the two states. Our son Aleks paddled and I, as usual, chased uncooperative butterflies with my camera! I thought I would leave you with a few impressions of the Stadium, Skyscrapers, Art & Mall. My next blog post will be about our trip across Canada, from the East to the West! 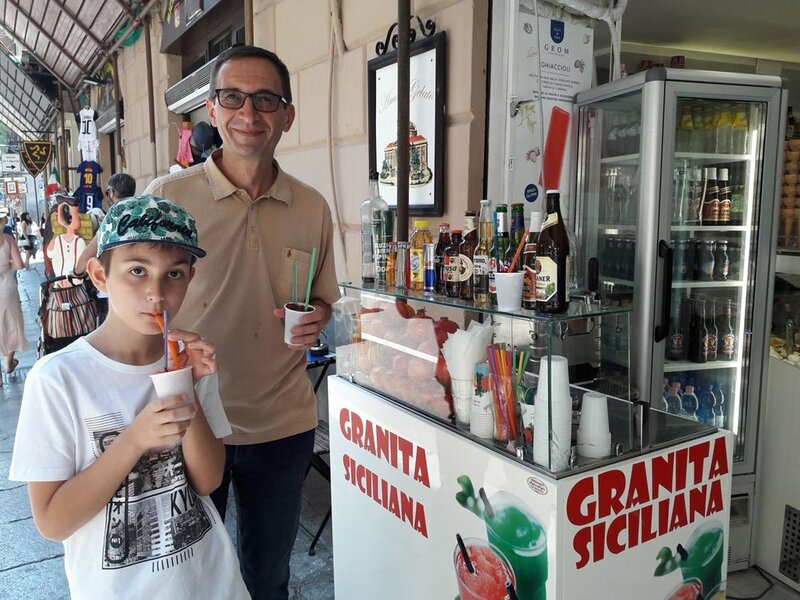 After living in Serbia for 8 months, my husband Dragan, our 11 year old son Aleks and I spent some time in Sicily. With great food, beautiful beaches, hot but not scorching weather and surprising history, Sicily is an intriguing destination. And not forgetting Mount Etna of course! Palermo’s old city centre is packed with historical buildings reflecting the myriad occupiers of this strategically placed island in the central Mediterranean. The rich interiors of the churches display the hotch potch of styles, Norman, Byzantine, Arabic and European all muddled up together. 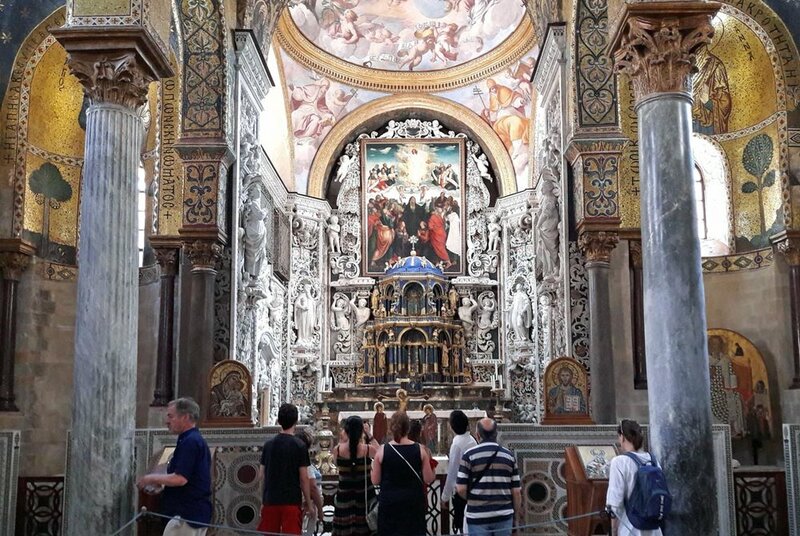 I particularly liked the inlaid rose-coloured, black and white volcanic stone decoration and the Byzantine paintings in the Church of Santa Maria dell'Ammiraglio. Teatro Massimo  in central Palermo, one of the biggest opera houses in Europe, was the location for the final shocking scene of Copolla’s film, ‘The Godfather III’. 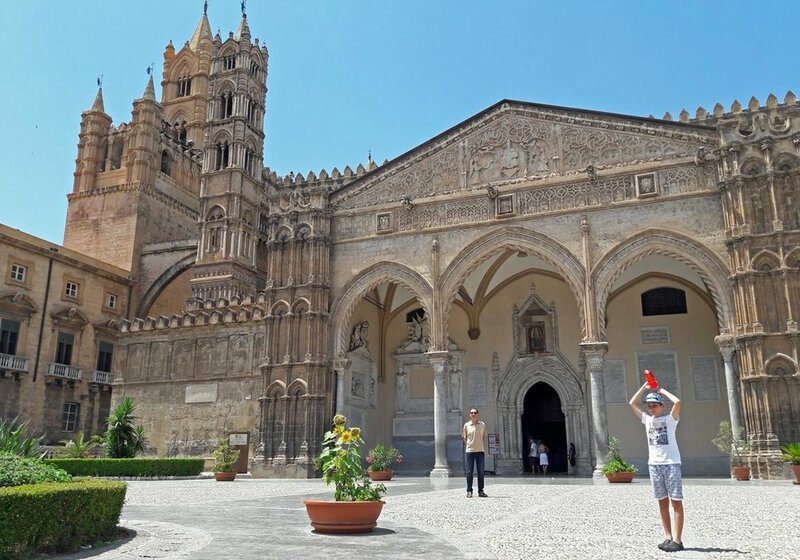 There are various film locations around Sicily for the Godfather films and in Taormina you can take a ‘Godfather Tour!’ The interior of Teatro Massimo is spectacular and guided tours are available. 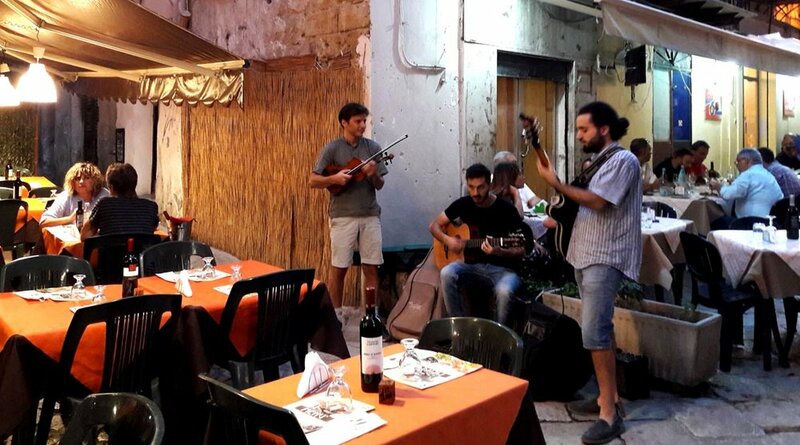 Just near the theatre, in one of the side streets, we discovered an eclectic mix of street entertainers and busking musicians. We also visited the Norman Palace  and the Cathedral, both stunning but exhausting in the heat. It is possible to visit the roof of the Cathedral at night and there is also a fascinating solar clock that lights up a meridian on the floor of the cathedral at a certain time of the day. After all that culture, we felt we deserved a Granita, a Sicilian sorbet-type dessert to cool off. Cattedrale di Palermo with Arabic and Norman features. It was hot hot hot! Aleks and I took the Hop-on Hop-off Bus to the Botanical Gardens, which is owned by the University. It has a huge collection of plants and is refreshingly wild and unkempt. We loved the Mimosa, commonly known as the ‘Sensitive Plant’, because it folds up its leaves when it is touched and the big, jungly ‘Strangler Fig’ (below). Insect repellent would have been a good idea here! Dragan was busy at his conference in Palermo, so Aleks and I jumped on the bus to the beautiful seaside town of Mondello for the day. Once a small fishing village, it is now a thriving resort with a sandy beach and warm clear water. Aleks loved the sea and the sand. The Art Nouveau Stabilimento Balneare was built in 1913 for aristocratic Sicilians to bathe in the sea. We had a lift partway to Taormina, a medieval hillside town, which is a good stopping off point for trips to Sicily’s active volcano, Mount Etna. A favourite of Richard Burton and Liz Taylor, Taormina has a gorgeous pedestrianised centre with boutiques, ceramic shops and restaurants. I enjoyed the car journey along the coast-road from Palermo. The building of the road was an expensive project, as the road has many tunnels and flyovers traversing dry rocky river-beds. Sicily often has flash floods in the winter and I could see debris scattered across the channels possibly from previous floods. I was determined not to miss the ancient theatre (see above), which has Mount Etna as its backdrop and I wasn’t disappointed. Performances are held here during the summer and the set was being prepared as I looked around. There is a beautiful view of Mount Etna from this pretty square. Sicily is great for pizza, (‘the best ever’ according to Aleks) and risotto (‘the best ever’, according to me) The pasta is wonderful too, but I was a bit surprised by the interesting mix of raisins and sardines in a Sicilian/Arabic dish called, ‘Pasta con le Sarde’. The seafood ain’t bad neither, it’s delizioso! Specialities to try are Arancini,  deep fried rice balls with savoury fillings and Cannoli, ‘tube-shaped shells of fried pastry dough, filled with a sweet, creamy filling usually containing ricotta’ . Oh and the ice-cream, I would recommend Gelateria Brioscia on Via M. Stabile, Palermo. Next stop Minnesota and Canada! New blog posts coming soon. Our time in Belgrade is nearly coming to an end, but my blog will continue when we travel to Sicily, the USA and Canada in a few weeks time. And of course we plan to return to Belgrade to stay with family as often as we can after that. A must see at any time of the year are Kalemegdan Park and Belgrade's Fortress, which offer stunning views of the confluence of the Sava and Danube rivers. Quickly retreat from the hustle and bustle of Belgrade's city centre to formal gardens, restaurants, souvenir stalls, sculptures and stacks of history. One evening, as the sun was setting over New Belgrade, I visited Kalemegdan Park and was pleased to discover some sculptures and activities that I was not aware of before then. The fortress is not so impenetrable these days! Cascading down the side of the Fortress are two gorgeous churches, one above the other amongst pretty gardens with roses and greenery. A lovely place to watch the sunset. Woman selling fruit & vegetables at the open air market. It's been pretty hot for weeks now and I guessed the water at Belgrade's 'Beach' may be warm enough to swim in. I caught the bus to Ada Ciganlija and went for a dip. The water was cool, but so refreshing. The lake has plenty of great restaurants, cafes, food outlets and more along its shores and I sat under a parasol and enjoyed an iced coffee close to the water's edge. It's possible to hire bikes, go water skiing and travel around the lake on a small train. There are many other activities to enjoy at Ada. It comes well recommended. There's one more blog from Serbia to come, as there are still a whole lot of things we need to see before we leave! See you soon! Spring has definitely sprung in Serbia. It's difficult to imagine that only a few weeks ago we were skiing on Kopaonik Mountain. There was also plenty of snow and ice this winter in Belgrade too. To dye the eggs, boil them in a saucepan filled with water, red onion skins and a little vinegar. After about 15 minutes turn off the heat and leave them in the water for a few hours. The eggs will become a deep maroon in colour. Skins from about three onions will be enough to dye at least 10 eggs. The eggs are dyed on 'Veliki Petak' (Good Friday) and then cracked and eaten on Easter Sunday. The eggs can also be dyed using plants as a resist which create beautiful shapes and patterns. To do this, take an egg, place a rosemary sprig on the egg and wrap it tightly in old stocking fabric. To keep the rosemary close to the egg, use string to bind the stocking at each end of the egg. The wrapped eggs can then be boiled in the natural dyes, red onion skin (maroon), red cabbage (blue) or regular onion skin (brown). Remove the eggs from the water. When cool, wipe a small amount of vegetable oil on the shells to give them a sheen. On Easter Sunday, there is a cute game to play with painted eggs. Cup your chosen egg in your hand and let your opponent tap your egg with hers. Then swap and tap your egg on theirs. The winner is the person who's eggshell remains intact! They taste good too! Check out Pinterest for a host of ideas for dying and painting Easter Eggs. Vrdnik Thermal Spring in Springtime! Our last trip to Vrdnik , a thermal spa town in the gentle hills of Fruska Gora, was in the dead of winter. We swam in the thermal spring water in the 'Termal Hotel', as snow was falling outside. So, another trip to Vrdnik in Springtime was a must. Our friends from England were spending a week with us and we all piled into a 7-seater and stayed the night in Vrdnik. The kids loved the pool and we all enjoyed the beautiful wild flowers and blossom. On our way to visit Vrdnik's Monastery, we were surprised to see a family distilling quince brandy in their garden! It is perfectly legal to distil your own liquor in Serbia and this family was making brandy for their restaurant which is called 'Vila Green Day' . Dragan asked if we could take a few photos and they kindly agreed. Vdrnik Monastery with beautiful Easter flowers and dyed eggs as a centre piece, below the arch. When Dragan and Aleks were at work and school, I decided to take a walk in the local woods. Spring flowers were emerging on the forest floor and a black squirrel scampered up a tree trunk. I was lucky to see a cuckoo swoop from tree to tree and unfortunately got bitten by a very large mosquito! On the way back I walked through Novo Groblje (yes, the cemetery again!) and I guessed that it was a special day, because the flower sellers were out in force. I wondered if it was 'The Day of Dead Souls' and decided to visit one of our relative's grave. Many people were placing flowers and candles on their loved one's final resting place and I noticed several people gently cracking a painted egg on the marble and laying it on the grave. I asked my Kuma (my Serbian Godmother), Daniela about this ritual and she explained that it was 'Pobusani Ponedeljak', the second Monday after Easter Sunday. Extra eggs are dyed/painted after Easter, especially to be placed on the graves. It was tragi-comic to see that some eggs had rolled off and had been nibbled by the crows who roost in the cemetery. On my way back from my Serbian lesson I stopped at Belgrade's Botanical Garden . 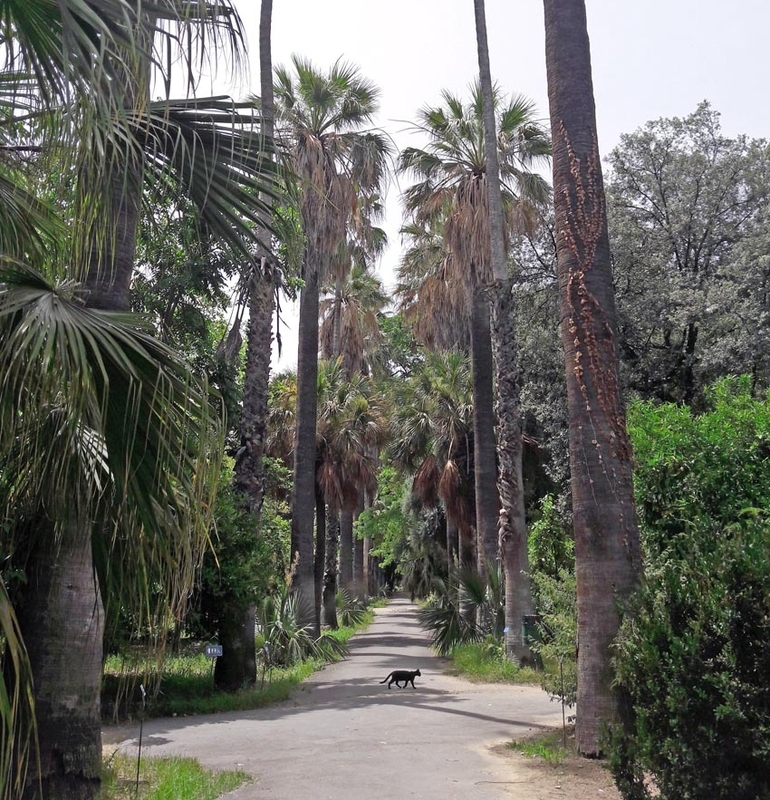 It is a delightful haven near the city centre and boasts a beautiful hot-house with tropical plants including, huge banana trees and fascinating cacti. The Japanese Garden is the pearl of this charming but relatively small hideaway. I would definitely recommend a visit. To finish, I think a new Serbian phrase is needed. This is the phrase I hear everyday from friends, relatives and people I pass in the street chatting to each other, 'Hoćemo da pijemo kafu?' - meaning, 'shall we have a coffee?' Now that spring has sprung, there is a million places to sit outside and do just that in Belgrade! Hoćemo da pijemo kafu? - Shall we have a Coffee? My husband, Dragan, who is a native Serb, our 11 year old son, Aleks and I have embarked on an adventure, by moving to Belgrade from England for 8 months. These are excerpts from my weekly diary. Kopaonik Mountain  along with Stara Planina , Zlatibor Mountain & Divčibare Mountain  are the main ski resorts in Serbia. With it's continental climate, Serbian winter's are cold enough to have an excellent ski season. We travelled by coach from Belgrade, a very comfortable 5 hour journey, with one pit stop for coffee. Most of the journey was on the 'autoput' (motorway) and then the coach wound it's way through the foothills, before ascending Kopaonik mountain for the last 45 minutes or so of the trip. Farmers were tending their fruit bushes and fruit trees in the villages and we enjoyed spying more and more snow as the coach slowly climbed the last 500 metres. Kopaonik mountain range is a National Park and is spectacularly beautiful. There was a lot of snow, to our surprise, as Belgrade was fairly mild when we left. Wildlife is plentiful here, but sadly many species, for example bears, have now disappeared from this area. Fallow deer, eagle-owls, wildcats and many other birds and mammals can still be found here and it 'is one of Serbia's most important bio-diversity hotspots for endemic flora' . In fact, we spotted some Kopaonik violets peeping through the snow. You can ski to the door of the Rtanj Hotel! (Photo taken from the chairlift). We stayed at the Rtanj Hotel, which is comfortable and clean, with a very friendly atmosphere. One hour ski school a day is included; ski passes can be purchased at the hotel and ski/boot hire is also available on site! We chose half-board. A hot and cold buffet with delicious Serbian favourites was offered for breakfast and dinner. Rtanj (difficult to pronounce!) is famous for it's wonderful 'Krofne' (doughnuts). Since you can ski to the door of this hotel, many skiers from around the resort stop for a drink, pljeskavica (burger) and doughnut for lunch. Keeping up with your kids! We experienced all the weather you can think of, rain, snow, fog, wind, blizzard, sun & even lightning, so catching this photo of the peak was quite a challenge. Dragan decided not to ski, but walked to the summit whilst we were skiing and took some lovely photos. Our friends from Belgrade were on holiday at the same time and we skied with them. They are good skiers and know Kopaonik really well, so we were able to ski all over the resort with them. The resort is extremely well run with an excellent rescue service, apparently. The lift attendants are very polite and helpful and the resort is great for kids and adults alike. The car thing isn't so great. The car-parks are chaos and walking along the road isn't much fun, there are no pavements and the cars drive a bit too fast for my liking! We just popped to a little caravan at the bottom of the slope and I was immediately sorted with boots and skis for about 10 euros and a ski pass for the button lift for about 5 euros! So off I went skiing in my civvies and had a wonderful time. When I was skiing, I noticed, to my surprise, another British woman speaking in English. You have to realise meeting Brits in Serbia, especially in Divčibare, was extremely rare in 2007. I just had to talk to her. She was married to a Serb and was on holiday with her family. Like me, she was so excited to 'discover' Divčibare and she was having the most wonderful time. We both agreed to not tell anyone in England about our amazing discovery!! Oops the cat's out the bag now! I have to say, skiing in Serbia comes highly recommended. Our flat in Belgrade overlooks one of the most important cemeteries in Belgrade, 'Novo Groblje' (the New Cemetery) , where many famous people from Serbia are buried. Not actually that new, the cemetery dates back to the 1860s. Over the last few months, some well-known people have been buried there, including Oliver Ivanović, the Serbian politician who was assassinated in Kosovo. A famous actor, who died relatively young, had his funeral there recently too. I said to my 'Kuma' (my Serbian godmother) , that I have never spent so much time in a graveyard as I do in Serbia. She laughed. But it is such a beautiful place. Last summer, the three of us visited Highgate Cemetery  in London, England, and were amazed to see so many interesting gravestones and epitaphs. At Highgate Cemetery, Aleks was fascinated to hear our guide tell us about tombs with giant spiders, to see Karl Marx's monument and to also see Douglas Adams' gravestone, with a pot of pens beside it. Novo Groblje (the New Cemetery) is also very important and is a member of the Association of Significant Cemeteries in Europe . If you get a chance to travel to Belgrade, I would recommend a visit here. 'Zadušnice' (the day of prayers for the souls) occurs four times a year in Serbia. It is customary for Serbs to visit their loved ones’ graves, light a candle and say a prayer. One of our relatives is buried in Novo Groblje, so we decided to pay our respects. Dragan gave me the heads up about an unusual custom before we walked through Novo Groblje to visit the grave. So, I wasn’t surprised to see a couple sitting on the marble slab of their relative’s grave having a light meal. This is not that common these days, but the wake for the funeral also used to happen at the grave of the deceased. A table cloth was placed on the gravestone and ručak (lunch) was laid out! Our daughter, Mila, told me later that this was also quite common in Victorian Britain. I was brought up to not walk on a grave, never mind have my lunch on one! Joking apart, this tradition is actually very respectful to the deceased. On the way to the cemetery (I was due to meet Dragan and Aleks there), I was waiting to cross the road behind a small troupe of soldiers in camouflage gear carrying rifles. They were also waiting to cross the road. I could have reached out and touched one of the guns. It’s not common in Exeter to be waiting at a pedestrian crossing with a group of armed soldiers. Half the company were women, and a rather brave middle-aged man decided to try and have a chat with the female soldiers. They ignored him of course. I only wish I could have understood what he was saying! Later when we were lighting the candle at our relative's grave, we heard the shots of the gun salute, as an important person from the army was being buried that day. 'Falling Snow, Pada Sneg'* was editioned by one of the Master Printmakers at the 'Centar za Grafiku' (Printmaking Centre)  in Belgrade. It is a drawing I made from a photograph taken in November. Two people pass each other outside the walls of 'Novo Groblje' in Belgrade. Shovelled snow is piled up in the foreground and some gravestones can be seen behind the wall. 'Belgrade Impressions' is a trio of linocuts I printed depicting some Serbian folk dancers with the Saborna Church's spire and the dome of the Orthodox patriarch's palace behind. The river Sava flows below. 'Most na Adi', the new bridge, spans the left and middle prints and Avala Communications Tower sits in the middle. To the right, is a depiction of Tašmajdan Park, with a tram, St Mark's Church and a woman wrapped up for the cold. The abstract geometric shapes hint at the 1960s Yugoslav concrete high-rise and mosaics, typical of Belgrade. I completed these prints at the 'Centar za Grafiku' in Belgrade. * Pada Sneg, means 'it's snowing' in Serbian. Our daughter Mila is visiting from London and we have some must see places to visit whilst she’s here! Born in Belgrade, she loves spending time in Serbia and seeing her extended family. We were invited for Sunday lunch by some relatives and our hostess made the most delicious food, including ‘Ruska Salata’ (Russian Salad), ‘Sarma’ (pickled cabbage rolls) and Pečenje (roast meat). Aleks ate at a separate table with his twin cousins who are also 11 and they both speak excellent English – their Dad blames Youtube for their language skills! A Whole Host of Architects in the Family! This side of the family is replete with female architects, including a fascinating woman called Natalija Matić-Zrnić, born in 1880. Our host that day, Mirko, is her Grandson and some years ago, he typed up her diaries, letters and memoirs, which were later published as a book. The book, 'Natalija: Life in the Balkan Powder Keg,'  has just been translated from Serbian and published in English - I plan to read it soon! The blurb at the back of the book says - "Natalija's diary is impressive in its scope; it covers more than half a century, five wars (including two world wars), four ideologies and numerous governments all told from the perspective of a remarkable, well educated middle class woman, mother of six, twice widowed, but never cowed." When I visited the Church of Aleksandar Nevski in Belgrade a few weeks ago, I was impressed to discover that the architect, Jelisaveta Načić (b.1878) was the first woman in Serbia to graduate as an architect. I asked Mirko if he thinks Natalija knew Jelisaveta Načić and he was pretty sure that she did. At the weekend Dragan, Mila, Aleks and I all piled in the car and set off for a two-night stay in the city of Novi Sad . Novi Sad is in Northern Serbia, in an area called Vojvodina and is about 60 miles from Belgrade. Vojvodina is flat, really flat – it was a sea millions of years ago, known as the Pannonian Sea. So, the soil here is dark and rich and the area has become the bread basket of Serbia. We met some friends from Novi Sad when we arrived and enjoyed a classic Serbian meal in a typical Serbian restaurant. You know the drill, gingham tablecloths, an acoustic Serbian band, top class waiting staff and traditional wine bottles and pickles in jars on display. Vojvodina was part of the Austro-Hungarian Empire in the 19th century and influences can be seen in many areas of life including the architecture and in the food. One of our party ordered a Vojvodina dessert, 'rezanci sa orasima' made from cooked pasta, sprinkled with walnuts and sugar. As Mila said, ‘it's just dough, nuts and sugar’ – very tasty! The Danube with the Petrovaradin Fortress on the opposite bank. Our friends were happy to have Aleks all day the next day, so Mila, Dragan and I walked along the banks of the Danube River towards the famous Petrovaradin Fortress . It’s a beautiful path with cycle tracks, cafes and a small beach to enjoy in summer. I asked about swimming in the Danube and unfortunately it’s too polluted, bit chilly in February anyway! Before crossing the bridge to the fortress, we stopped at a Holocaust memorial on the river bank. Fresh flowers were laid in remembrance of the Jews and Serbs who were killed by the Nazis at the site during WW2. We crossed the bridge and walked up to the Fortress, the location of the famous Exit Music Festival , held here every summer. Notable musicians include Franz Ferdinand, Robert Plant & Lauryn Hill and it is now one of the biggest music festivals in Europe. The site of the fortress has seen some sort of settlement for over 20,000 years, evidenced by Palaeolithic archaeological finds, plus Roman, Austro-Hungarian and Turkish settlement. It’s an impressive structure built atop a natural rock. There is a maze of tunnels beneath the fortress where groups of soldiers would take cover. You can enter the tunnels, but I wasn’t too keen when I heard that some kids got lost (and found!) in the tunnels last summer! Telling the Time isn't Easy Here! The Clock Tower was a great photo opportunity and is unique in that the large hand of the clock represents the hours not minutes, so that fishermen on the Danube could see the time more easily. Serbs do the whole café/restaurant thing brilliantly and there were at least two places to eat or have coffee. We settled for coffee and then trundled back down the hill to Novi Sad city centre. Having had a meat feast the previous night we chose squid and octopus for lunch at a lovely restaurant, called ‘Gondola' . They even serve cake in a flower pot! Ultra modern with very high ceilings, a copper clad bar and industrial style light fittings. We walked through the park to the city centre, passing the pastel-coloured buildings from the 19th century and Novi Sad’s Catholic Cathedral towards the Synagogue. The Jews were decimated in Vojvodina in WW2 and many Jewish people that survived left for Israel after the war. The Synagogue  no longer functions as a religious building but is now a cultural centre and concert hall. Novi Sad's Synagogue, which is now a concert hall. We briefly met another friend from Novi Sad, Joviša, who used to work with Dragan at the University in our home city of Exeter, in the UK. He showed us around commenting on Novi Sad and the architecture. We made the typical comparisons between Belgrade and Novi Sad - there seems to be a bit of friendly rivalry between the two cities. Joviša, said to me, 'Can you guess which is my favourite building in Belgrade?' 'Glavna Pošta' (main post office) . I was so surprised, because this is my favourite building too. Joviša pointed out that it is designed in the shape of a eagle spreading its wings. It's an unusual choice, as it is not exactly pretty! After the three of us had nearly completed a half marathon walking around Novi Sad we felt it was time to head back to the Air B&B for a rest. That evening, with the promise of 'ćevapčići za poneti' (take away meat patties), the three of us walked to our friends' house to enjoy a meal and collect Aleks.